FUN! Frankenweenie on DVD January 7th! We didn't get to see Frankenweenie at the movie theatres this past yer, so we are thrilled to have to see it come out on January 7th! It will be our first week back at school after the holiday break, so it seems fitting for a Friday movie night! Frankenweenie is a story of Victor, who brings his dog Sparky back to life, only to have him escape, and the tale that follows. 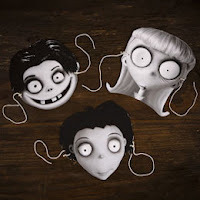 All this in 3D and black and white, but wrapped in the mysterious world of Tim Burton! Bring on the palomitas! And check out this preview below! You can also check out these fun Frankenweenie activities from Disney and Bakerella! And of course we are going to share the love! Three lucky readers will receive a DVD combo of their very own! Comment on our post below and we will randomly select 3 winners. Don't forget to leave your email so we can contact you! Giveaway ends January 7th, 11:59 pm. I really wanted to see this movie but with munchkin we havent braved the theaters yet so we havent been to a theater in 4 yrs! I would love to win this! alvina_castro@yahoo.com Thanks for the chance! I would love to see this movie. It looks really cute. Thank you for the giveaway! Have not seen Frankenweenie yet, but would love to see it. odysseycreative@hotmail.com. Would love to watch this with my kids! Kat071304@hotmail.com thank you!